The only reason I’ll ever make pizza on a grill again is that Tony said it was the best pizza he has had in his life. OK, maybe I’ll tackle this nightmare again. The burns on my arm are starting to heal. Part of the hassle was my own fault. I was too lazy to move the grill, even though I knew I’d have to reach across hot coals to add the toppings. Had I shifted the grill a quarter turn, I could have slid the pizza side to side rather than front to back, exposing my forearm to enough heat to cook a leg of lamb. Even so, the whole process is a hassle. Why not just shove the damn pizza in the oven rather than pre-cook the toppings and schlep the dough, olive oil, salt and pepper, tongs, pizza peel, plates, mitts and the toppings outside where you will stand over – and I mean directly over – hot coals making one single-serve pizza at a time? Just poke me in the eye with a meat fork, why don’t you? Many people do make pizza on their grills and claim to enjoy it, so I’ll resist the temptation to give Robin the phone number of my favorite carry out. One helpful bit of information is that grilled pizzas are necessarily New York-style thin and crisp. Thick crusts would burn before they cooked through. Also, gas grills are probably easier for pizza-making than charcoal, which is what I used. I figure using gas is almost cheating, though. If you crave adventure (and true smoke flavor), go for charcoal. Grilled pizzas are made by placing a thin round of pizza dough directly on a greased grill grid over hot coals. After one minute or less, the dough is flipped and moved to the cool side of the grill, where it is topped and then moved back over the coals for one minute to cook the bottom of the dough. Tip: The grid should be oiled and very hot to prevent the dough from sticking. The process is very fast. The toppings have no time to warm up, so they must be pre-cooked and at room temperature. Adding the cheese first, directly to the just-cooked top of the dough, helps it melt. If you want to warm the toppings more, slide the pizza back onto the cool side of the grill and cover with the vents open. Tip: Line up the grill grate so you can slide the pizza with the flow rather than across the rods. When the dough is over the coals, watch it closely because it can burn in a New York second. Lift the edge with tongs to check its progress. Slide it off the heat when the bottom is blistered and dark brown. Before starting, have everything – equipment, toppings, dinner plates – lined up within reach of the grill. I placed each 12-inch dough round on its own dinner plate on floured parchment paper and covered them with plastic wrap (after flouring the top of the dough) so they wouldn’t dry out. I didn’t want to deflate the risen dough by stacking them. I used a thin pizza peel to move the crusts around the grill, but simplified the initial placement on the grill by picking up the piece of parchment on which a raw dough round was resting and inverting it directly onto the grill. If you floured the parchment, the dough will separate from the parchment rather than sticking to it and going up in flames. As you’ve probably gathered, a charcoal fire is built on one side of the grill, leaving the other side cooler. Use enough coals to last through three pizzas. If you’re using a gas grill, heat one side to hot, then reduce the heat to medium for cooking. Brush the grid with oil before you begin and between each pizza. Remove the grid from the fire to do this or you, too, will burn your arm in a flare-up. Make the dough rounds small enough to fit on half of your grill. The dough recipe I used, From King Arthur Flour, makes three 12-inch pizzas. One at a time, they fit on one side of my full-size kettle grill. As far as equipment goes, you’ll need two oven mitts and long tongs. A thin pizza peel is handy but not essential. A brush for applying olive oil and utensils for the toppings round out the must-haves. Before hauling the dough outside, I grilled the toppings for the pizza I made for my husband. 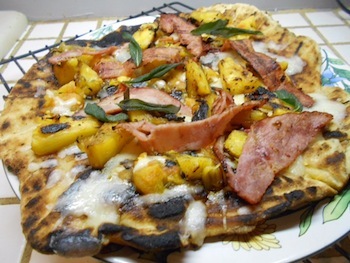 His favorite pizza is ham and pineapple, so for each pizza I grilled a large ripe tomato to squish and spread over the crust, two ½-inch-thick slices of fresh pineapple, and a few thin slices of ham. The pizza also was topped with shredded mozzarella and crisp sage leaves that I fried in the kitchen. Yes, the pizza was really good. Combine flour, salt and yeast in the bowl of a heavy stand mixer. Stir well. Add water while mixing to make a smooth, soft dough. Note: Use 1/8 cup less water in summer (or in a humid environment), and 1/8 cup more in winter (or in a dry climate), and somewhere in between the rest of the year, or if your house is climate controlled. If kneading with a stand mixer, it should take 4 to 5 minutes at second speed and the dough should barely clean the sides of the bowl. Don’t over knead; it should hold together but can still look fairly rough on the surface. If making the pizza now, place dough in a greased bowl, turn dough to coat all sides, cover and let rise until very puffy, about 1 hour. If making the pizza the next day, as I did, rise just 45 minutes and then refrigerate, covered, overnight. Remove pizza from refrigerator and let warm for 2 hours at room temperature before continuing. Cut dough into three pieces. Roll each piece on a floured surface as large as it will go (probably about 8 or 9 inches); cover with plastic wrap and let rest for 15 minutes. Uncover and roll to a 12-inch circle. Place each dough circle on a piece of floured parchment on a large dinner plate or tray. Cover with plastic wrap and let rise about 1 hour longer, until visibly puffy. While the dough rounds rise, build a hot charcoal fire on one side of a full-sized grill. If using gas, preheat to high, then reduce to medium for cooking. Inside on the stove, heat about ¼ inch vegetable oil in a skillet over medium-high heat. Drop in a few sage leaves at a time, frying for 5 to 10 seconds or until the leaves shrivel and curl but still are green. Remove with a slotted spoon and drain on paper towels. When fire is hot and coals are partially ashed over, brush the grill grid with oil and heat until hot. Place the tomatoes, pineapple and ham slices on the grill. Turn with tongs, removing each ingredient when it is warmed through and marked by the grill. The tomatoes must cook longer, until they begin to slump. Cut ham into strips and cut pineapple into bite-sized chunks. With clean hands, mash tomato in a bowl. Arrange all of the toppings, including the cheese and sage, near the grill. Spread the coals over one side of the grill. Remove the grill grid, brush again with oil and return to the grill. Have the dough disks, salt and pepper, olive oil, a pastry brush, tongs, mitts and pizza peel handy. Remove the plastic wrap from one dough disk and brush with olive oil. Season with salt and pepper. Lift it, still on the parchment paper, and flip it, oiled side down, directly onto the hot grid over the coals, pulling away and discarding the parchment paper. Straighten the dough with tongs if necessary. Brush the top of the dough disk with olive oil and season with salt and pepper. Cook the underside for about 1 minute, until it is dark brown (check by lifting a corner with the tongs). Slide a thin pizza peel under the dough and flip over, raw side down. Immediately slide to the side of the grill away from the coals. Sprinkle one-third of the cheese over the browned crust. Top evenly with one-third of the crushed tomato, pineapple and ham. Season with more salt and pepper. Slide the pizza directly over the coals and cook for about 1 minute, until the underside is dark brown. With the pizza peel, transfer to a plate and scatter some of the sage over the top. Repeat with remaining dough disks and toppings. Makes 3 thin pizzas, each serving 1 to 2 people. It’s quince season. I know this because I found a motherlode of the fruit while walking my dog in Akron’s Highland Square last week. The “hedges” that partly encircle the block around FirstMerit Bank and Mustard Seed Market are actually quince bushes. Look closely and you’ll see dozens of the ripe yellow fruit hanging from the branches and rolling onto the sidewalk. Quince look like small, misshapen apples or pears. They are hard and yellow with a white interior and are inedible when raw. Even in this state, they emit a faint aroma of citrus and vanilla, which blossoms into full-on lusciousness when cooked. The alchemy of heat even changes the color, from white to pink. To cook quince, measure out 2 pounds, pare the skin, remove the cores and cut the fruit into hunks. Combine in a saucepan with about ¾ cup sugar and 4 cups water. Flavorings such as a vanilla bean, star anise and sliced ginger may be added if desired. Bring to a boil, stirring until sugar has dissolved. Cover loosely and simmer for about 50 minutes, until the fruit is soft and pink. If using the fruit right away, strain, saving the liquid for other uses (over ice cream, in cocktails, etc.). If using later, refrigerate in the poaching liquid. Poached quince may be frozen. I am a food-ignorant bachelor who uses the oven three times a year. My old Granite-Ware roaster had several scraped-away areas of the finish when I inherited it from my grandma. I trashed it, then I bought a T-Fal roaster at Target. By the second washing the T-Fal had started to peel away in a few spots. I threw it away, too. I do not want to ingest the coating, which always comes off. OK, I zipped thru the Internet and saw an All-Clad aluminum no-peel unit that has a cover. I want the cover, as I sometimes cook stuffed peppers, etc. that would spray all over the oven. It was $137. Do you know a place locally that has this aluminum roaster with lid, big enough for an 18-pound turkey? I looked at Kmart, Target and Kohl’s. Seems they stock low-priced junk. I do not know if I need that grate on the bottom or not. Dear John: Macy’s carries All-Clad. So does Western Reserve Cookery in Hudson and Crate & Barrel, Williams Sonoma and Sur la Table (stores in the Cleveland area). I do not use a roaster for cooking turkeys. The high sides and lid results in steamed meat. I use a shallow roasting pan, no lid, no grate. Good luck finding what you need. I love the zucchini recipes you’ve been running! Here are two that I have been using all summer. The “lasagna” is not quite the cheesy squash casserole a reader requested, but it might be close. It came from a good friend in Perrysburg about 30 years ago. The cake is from my mother-in-law, about 35 years ago. Zucchini never goes out of style. Brown meat and onion in a 10-inch skillet in a bit of oil over medium heat. Drain off grease if necessary. Add tomatoes, tomato paste and spices, reducing heat and simmering for 5 minutes. Slice zucchini. Beat together cottage cheese and egg. In an 8- or 9-by-12-inch baking dish arrange a layer of zucchini slices. Sprinkle with 1 tablespoon flour. Spread with all of cheese/egg mixture, half of meat mixture, and sprinkle generously with mozzarella cheese. Repeat with another zucchini layer, a tablespoon of flour, mozzarella cheese and remaining sauce. Bake at 375 degrees for 40 minutes in an oven or 12 minutes on high power in a microwave (cover with waxed paper.) It should be bubbling and the zucchini should be fork-tender. Let stand for 10 minutes for easier cutting. Thoughts: I used ground turkey to keep this relatively vegetarian. The original recipe called for tomato sauce, but the taste was even fresher with chopped tomatoes. If you have fresh herbs they should be tripled. I have experimented with a Greek version with ground lamb and feta cheese, and it is quite good. Preheat oven to 325 degrees. Sift together flour, spices, salt, baking soda and cocoa powder. With a mixer, beat sugars with butter until light and fluffy. Stir together oil, eggs, vanilla and buttermilk or yogurt. Beat in liquid mixture and flour mixture alternately in three additions each. Fold in zucchini. Pour mixture into a greased and floured 9-by-13-inch cake pan. Sprinkle with chocolate chips. Bake for 45 minutes or until cake begins to pull away from sides of pan. When cooled, frost with desired frosting. We prefer to eat it without. Dear Cynthia: Thanks for adding to our zucchini recipe stash.